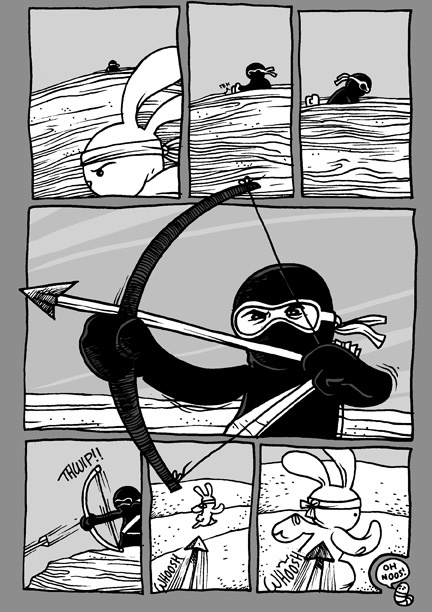 I told you our new masked foe would be quick to attack, but will Bunny be able to survive. Uh� yeah, probably. 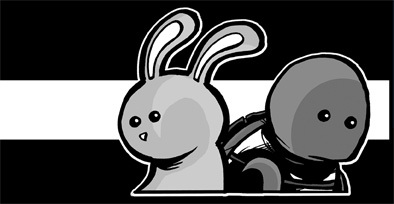 This isn�t called Turtle and dead Bunny even though Zombies seem to be all the rage right now. Since the strip began I�ve been offering up different images here in the blog of Bunny as popular movie characters. Something I call �Bunny at the Movies�. 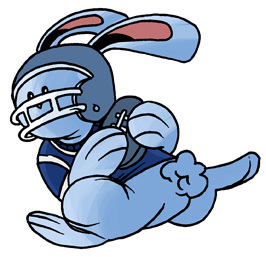 Well in honor of last night�s Super Bowl I decided to switch gears a little and put up this doodle of Gridiron Bunny. As a die-hard Eagles fan I didn�t particularly care who came out on top between the Patriots and the Giants, but they did put on an amazing show. And as much as I would have liked to see the perfect season take place, it�s always nice to see the underdog win. Thanks so much for reading. A quick reminder to check out the Turtle Victory shirts, on pre-order now for only 15 dollars! And also� tomorrow, on Super Tuesday I�ll be announcing some very big news for Turtles next big race. Some very big news that involves reader voting. Swing by tomorrow for the update! EDIT: (Tuesday February 5th) As promised, we have some very big news on this Super Tuesday � the announcement of the potential candidates for the second race. Turtle will race one of these opponents but before he does, you need to decide which one! Go to the official vote page for bios and images of the three potential racers, and to cast your vote!